Whether your style is traditional, modern or somewhere in between, there are a surprising number of glow-in-the-dark and illuminated products available to add whimsy or practicality (or both!) to your bathroom. More of a minimalist when it comes to glowing bathrooms? This toilet seat from Kohler lights the way to the throne with less drama. Regardless of which route you go, fumbling to the bathroom in the middle of the night just got a lot easier. If mood-enhancing color therapy is more your style than accident-free nocturnal visits to the loo, you have options, as well. With eight colors to sequence or select from and a continuous cascade of water over the sides, the Sok bath from Kohler is the ultimate in chromatherapy. 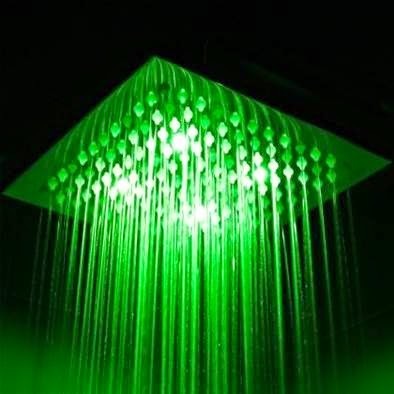 But tubs aren’t the only fixture worthy of colored lights: there are a variety of LED shower heads that allow you to control (or randomize) the color under which you bathe. Of course, you could always go for an LED shower head that indicates the water temperature instead (like this one from Hudson Reed). Not surprisingly, blue light indicates that the water temperature is acceptable for polar bears, while red light lets you know it’s rather toasty. Sandwiched between the two is the green light that might be the Goldilocks-zone for some or the not-quite-there-yet indicator for others. We think it makes groggy mornings a little more interesting. If you’re ready to remodel your bathroom and want to implement these or other clever products, let us know.